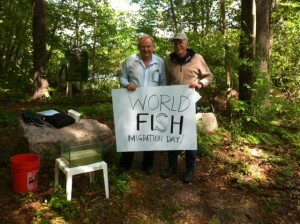 The first annual World Fish Migration Day open house at the Supply Ponds fishway on May 24 was a great success. About fifty people from Branford, North Branford and Guilford stopped by to visit the fishway, learn about the Alewives and American Eels that migrate up Queach Brook and into the Supply Ponds each spring, and share their enthusiasm about the open space that has been protected in Branford in the last half century. 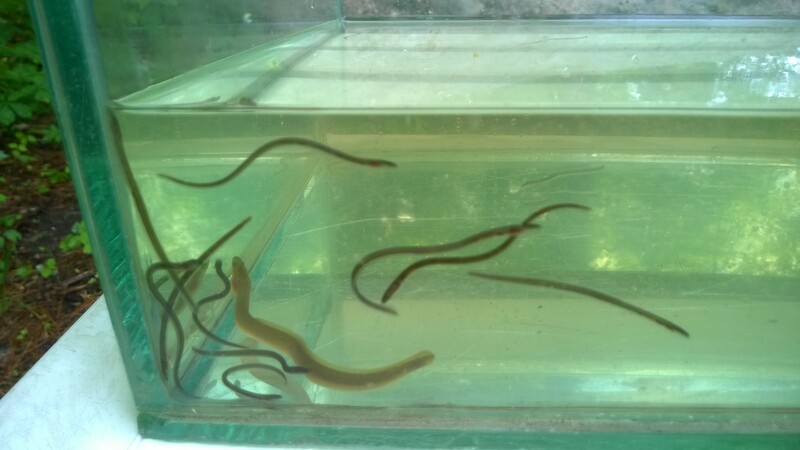 Bengt Kjellberg provided some live entertainment – a dozen or so glass eels (two-inch-long juveniles hatched this year in the Sargasso Sea) and a larger elver that probably hatched last year but didn’t complete its migration over the dam. Bengt netted the critters the day before as they wriggled up the fine-mesh net that has been draped over the spillway wall to give them something to climb up last three feet into the pond. The elver and some of the glass eels demonstrated the skills they use to ascend a stream over rocks and other obstructions by climbing half a body length or more out of the water and up the side of the aquarium that held them. 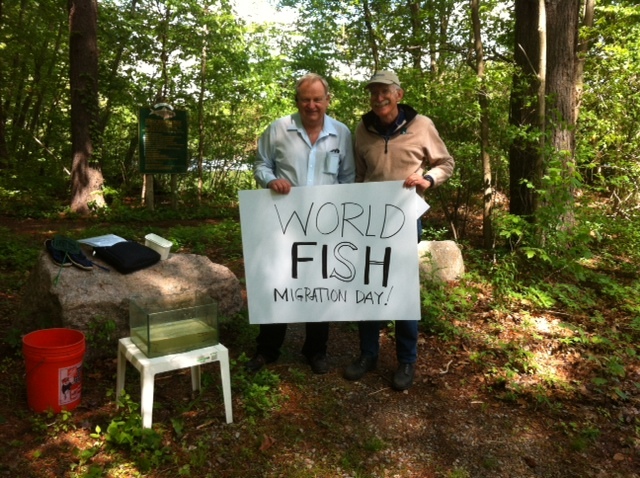 The May 27 Fish Report indicates that the Alewife migration is finished at the Supply Ponds and most other monitored locations across the state. State-wide, numbers were about 35% lower than the last two years, possibly because of the cooler water temperatures. In contrast to these generally lower numbers, the Supply Ponds fishway counter passed 1,395 fish, more than twice the numbers counted in 2012 and 2013. The difference is probably due to the more normal level of water in the Supply Ponds and Queach Brook this spring.